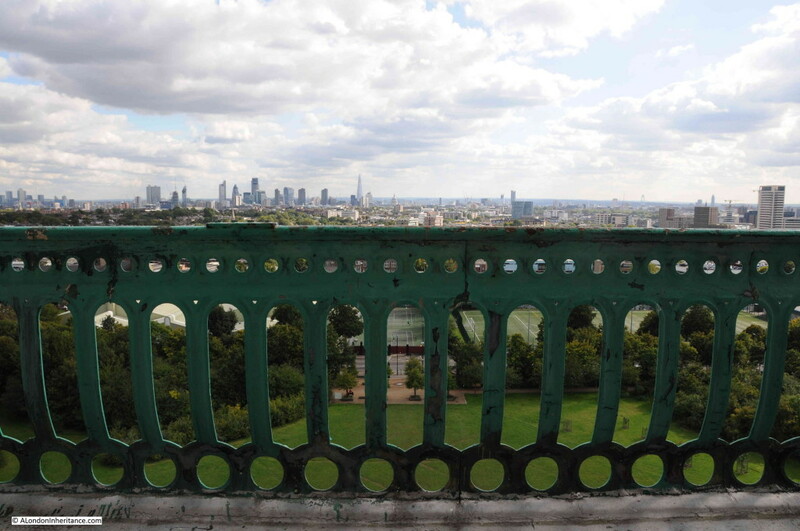 I have long wanted to see inside the Caledonian Park Clock Tower and the Open House London weekend provided the opportunity to do so, with tours available on the Saturday, so on a warm, sunny afternoon I was in Caledonian Park ready for the climb. Referring back to yesterday’s post, the Clock Tower from the south. The old Copenhagen House would have been just in front and to the left of the Clock Tower. At the base of the tower are plaques recording the march in support of the Tolpuddle Martyrs and the original Copenhagen Fields and House. Along with the weights that drive the clock. 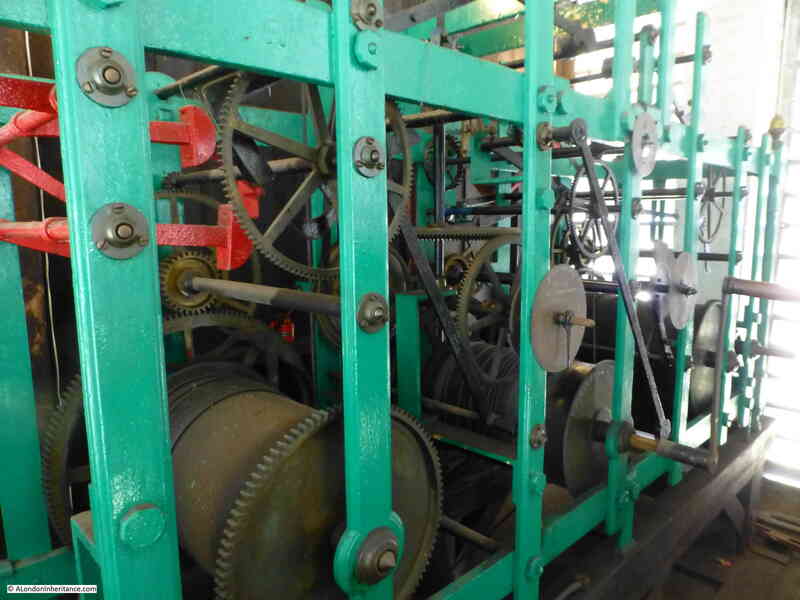 The clock has not been converted to an electric system, the original mechanical clock is still in place, driven by weights and needing to be wound once a week. 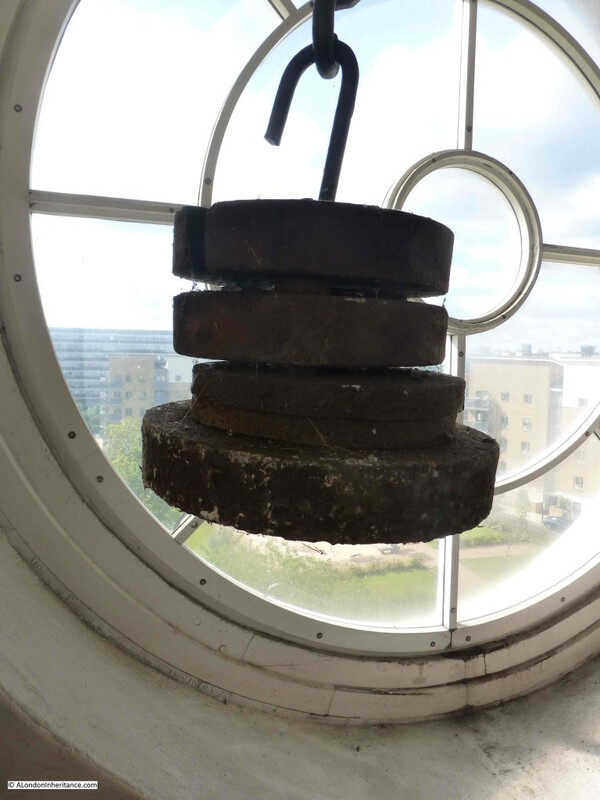 The weights have almost half the height of the tower to fall when the clock is fully wound to provide a reasonably long running period. 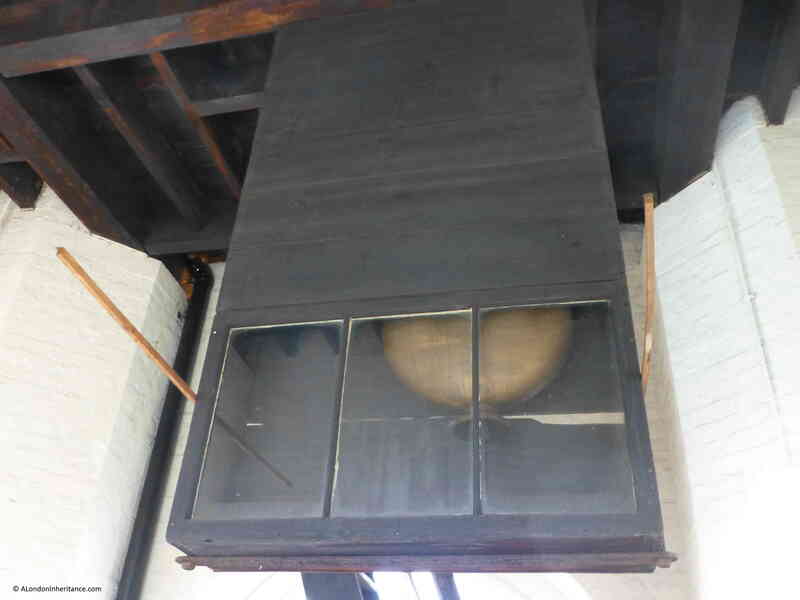 On the floor below the clock mechanism is the pendulum. Fully operational with a smooth sweep back and forth. 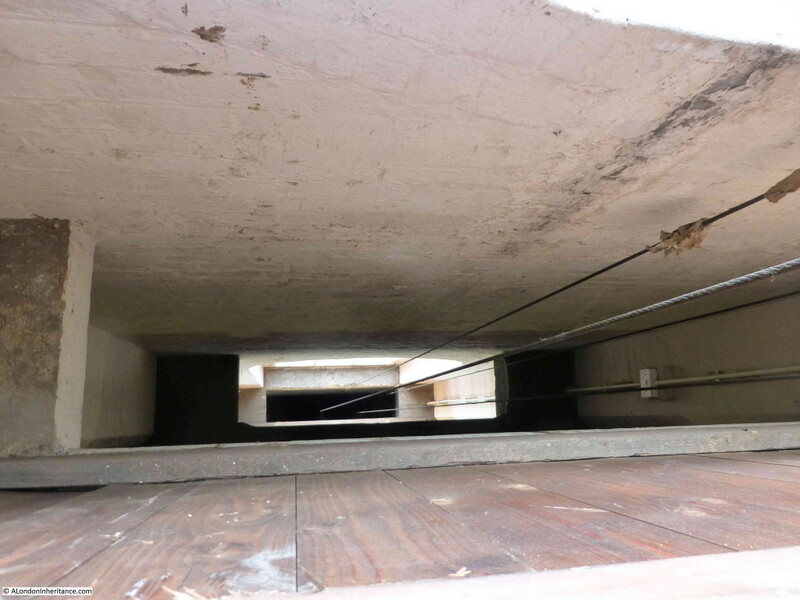 The bottom part of the near vertical wooden steps to climb between floors can just be seen below the pendulum. One of the dials recording that the clock was constructed by John Moore & Sons of Clerkenwell in 1856. 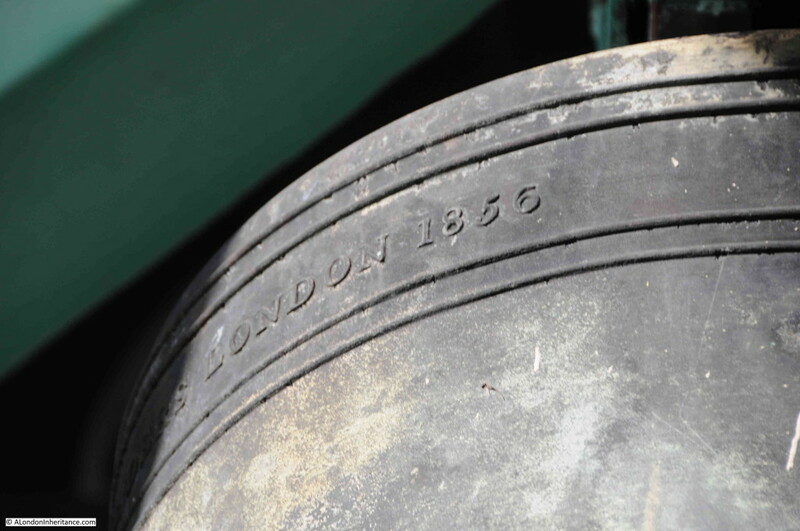 Founded in 1790, John Moore & Sons operated from Clerkenwell Close for the whole of the 19th century, finally moving to Spencer Street in 1900 where they would remain for a further 20 years, mainly as watch makers. 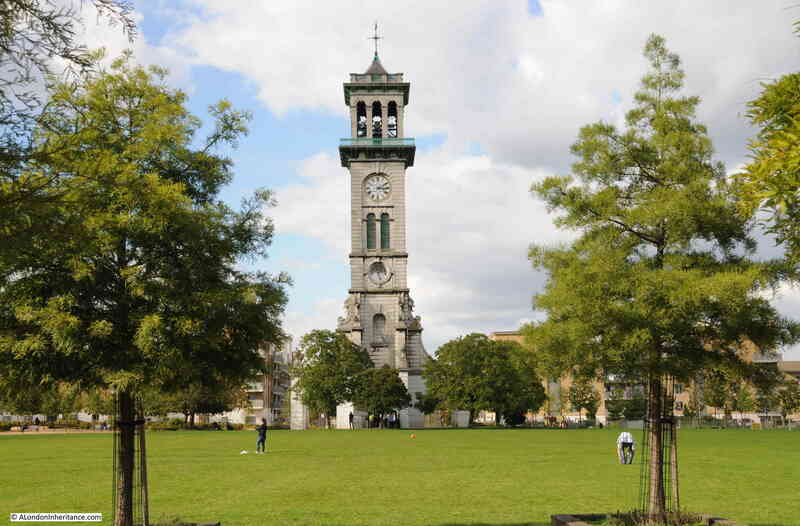 As well as the Caledonian Park Clock Tower, mechanisms manufactured by John Moore & Sons can still be found in many churches including St. Michael, Wood Green, St. Mary the Virgin in Mortlake and Holy Trinity Church in Fareham. 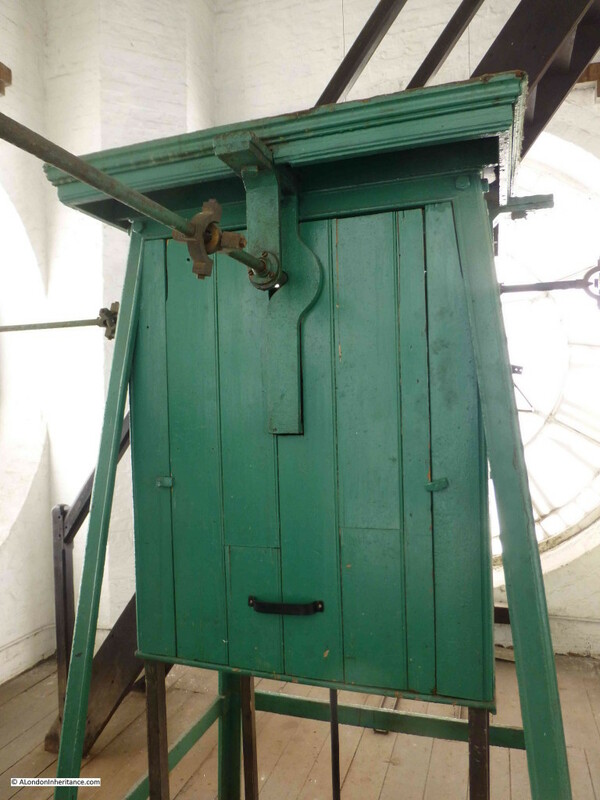 There have been a few restorations of the clock in the intervening 155 years, however it is still essentially the same as when it was first installed. 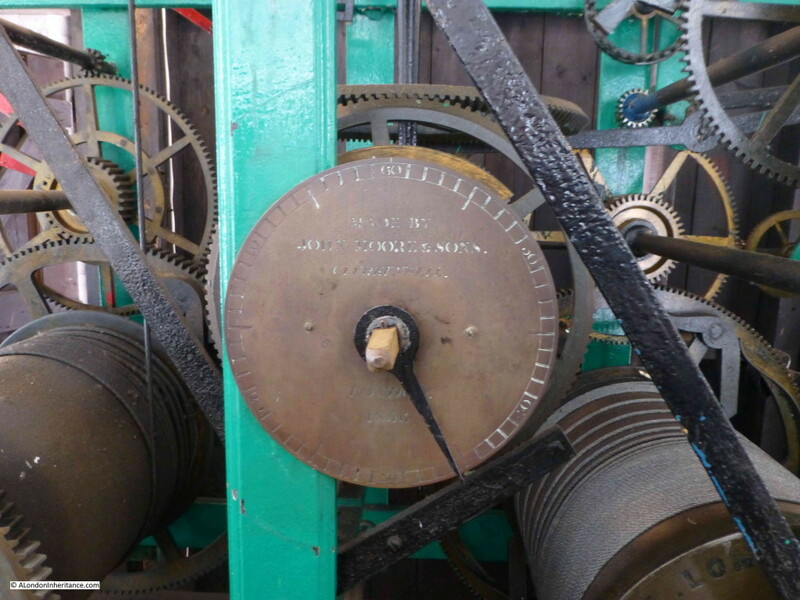 On the next floor up is the mechanism that takes the single drive from the clock on the floor below and drives four rods, one to each of the four clock faces on each side of the clock tower. Unfortunately the actual mechanism was hidden within a large wooden box. 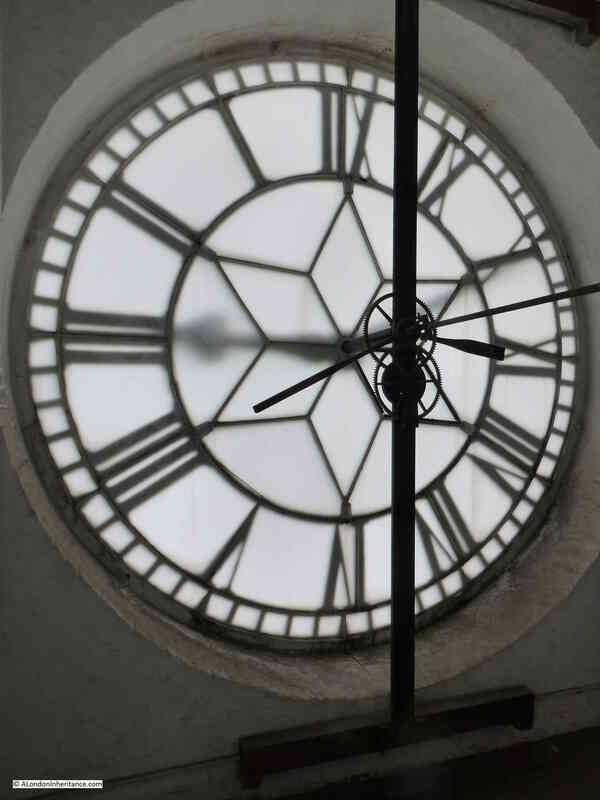 One of the clock faces. 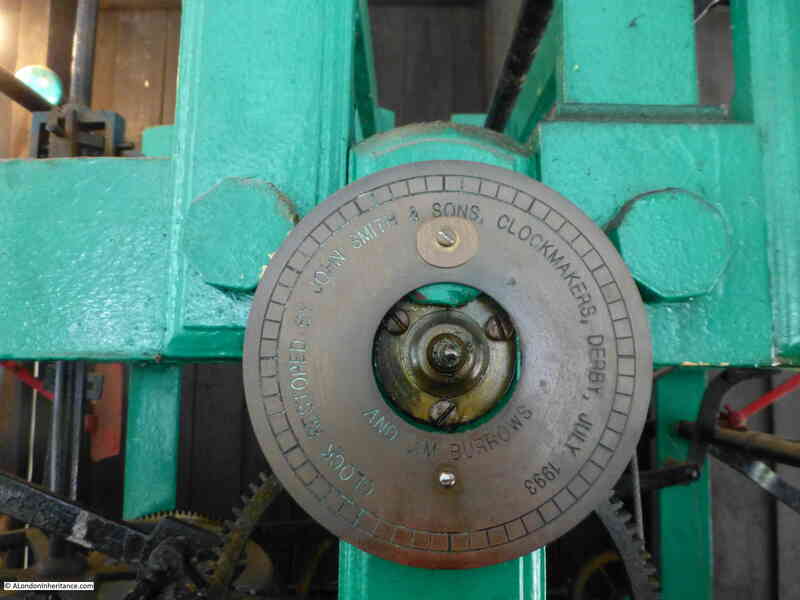 The rod running from the right drives the clock and the gearing in the middle is the reduction drive so that both the minute and hour hands can be driven from the single drive. 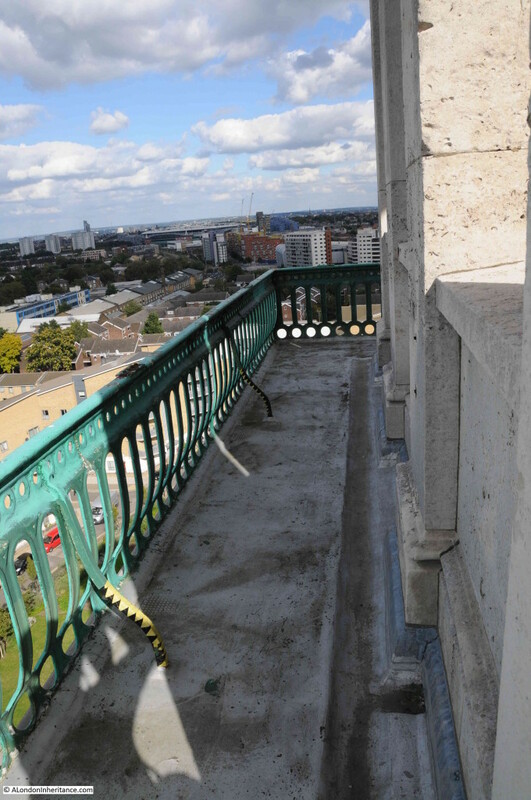 The final set of steps provides access to the viewing gallery around the top of the Clock Tower. 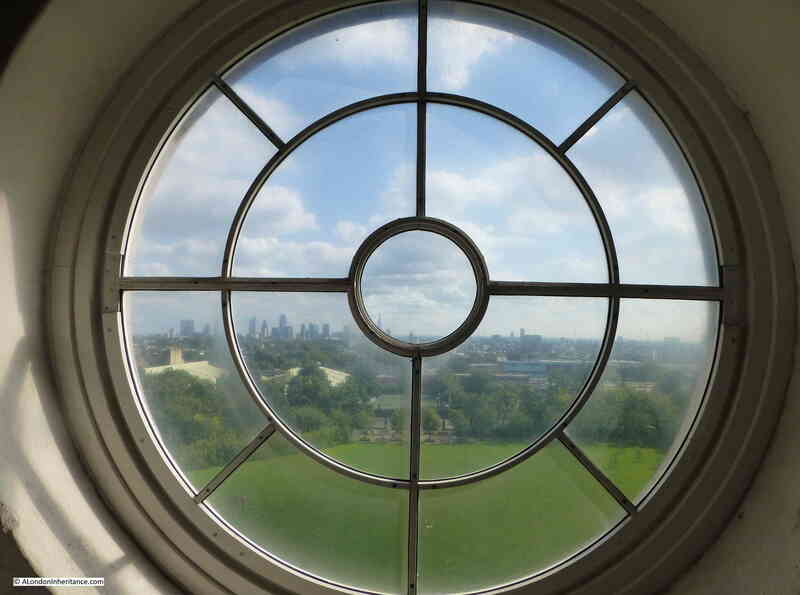 Through a small doorway, facing due south and straight into the following view across the whole sweep of central London and to the hills beyond. 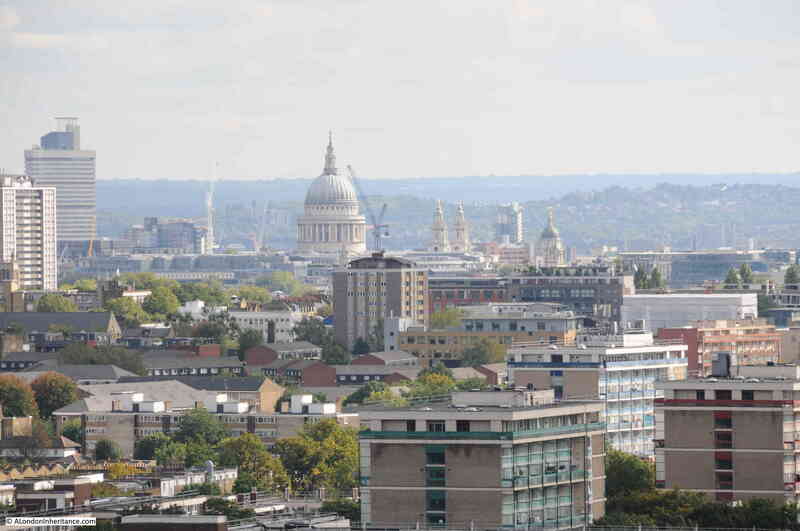 St. Paul’s Cathedral on the western edge of the City. When the Clock Tower was originally built. the city horizon would have seemed very flat with the exception of St. Paul’s and the steeples of the City churches. The walkway around the Clock Tower is not that wide and the railings around the edge did not seem very high given the height of the Clock Tower. 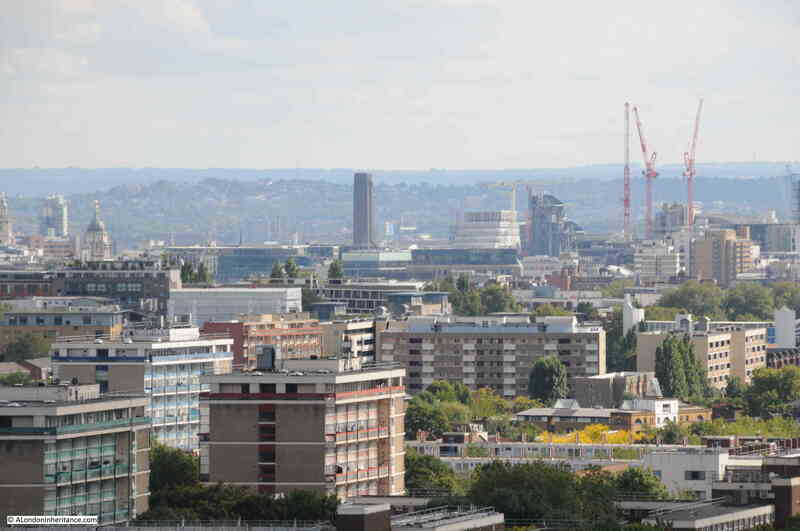 Looking to the south west, with the BT Tower in the centre. The area now covered by trees, the block of flats to the right and the sports pitches were all part of the Cattle Market. 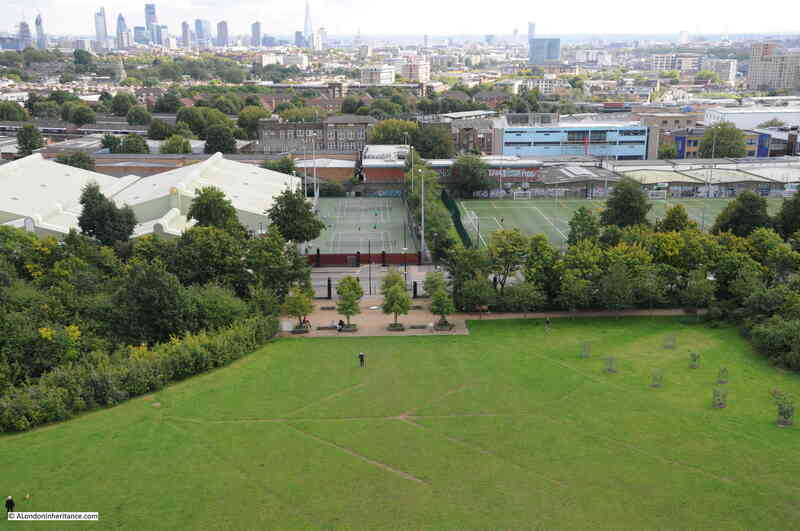 The view looking down onto the park. 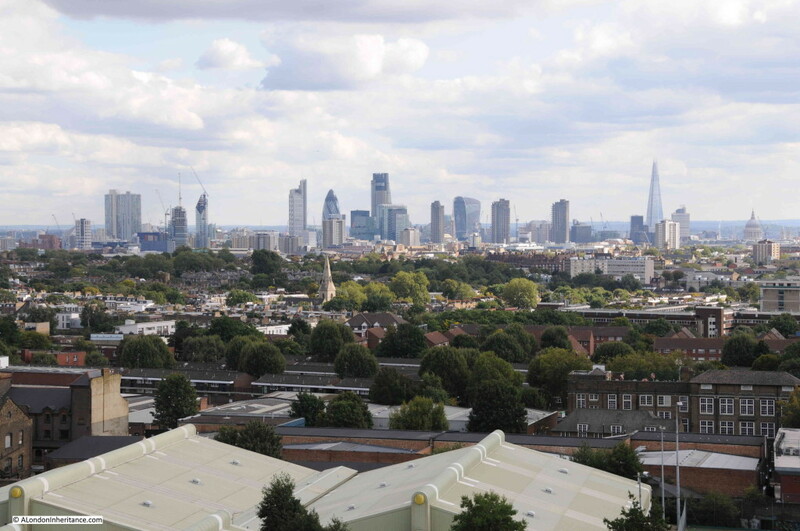 The area occupied by the park, the football pitches and the sports complex were also part of the Cattle Market. 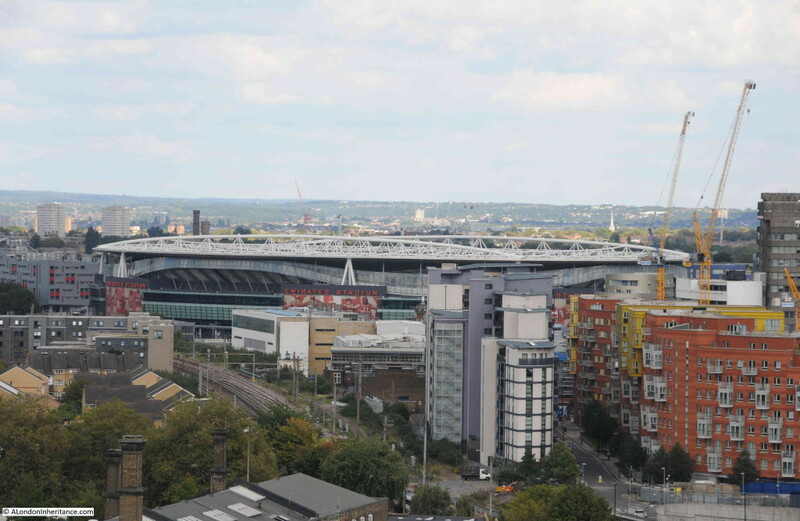 Unfortunately I have not been able to find any photos taken from the tower whilst the market was in operation. It must have been an impressive sight on a busy market day. 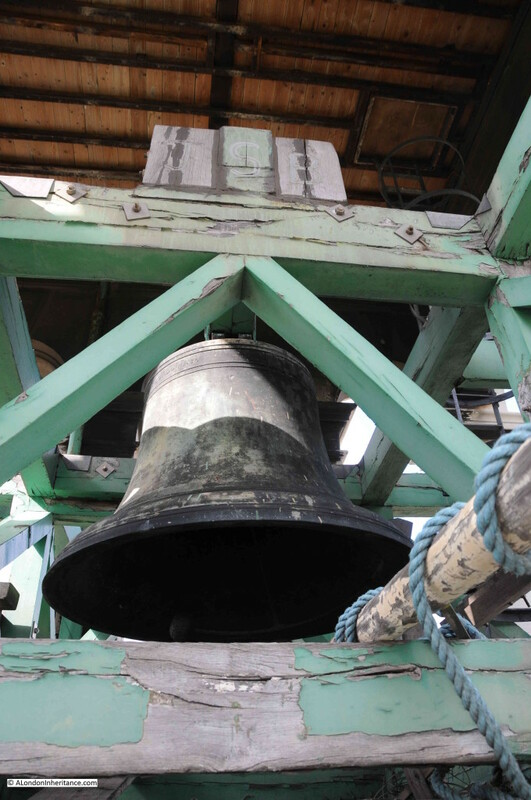 Above the viewing gallery are the bells, not used having been out of action for many years. The Caledonian Clock Tower is a fantastic survival from the Metropolitan Cattle Market. Largely unchanged since first built and faithful to James Bunstone Bunning’s original design. It is a Grade II* listed building to recognise the important part the Clock Tower played in London’s commercial and industrial heritage. Long may it survive. 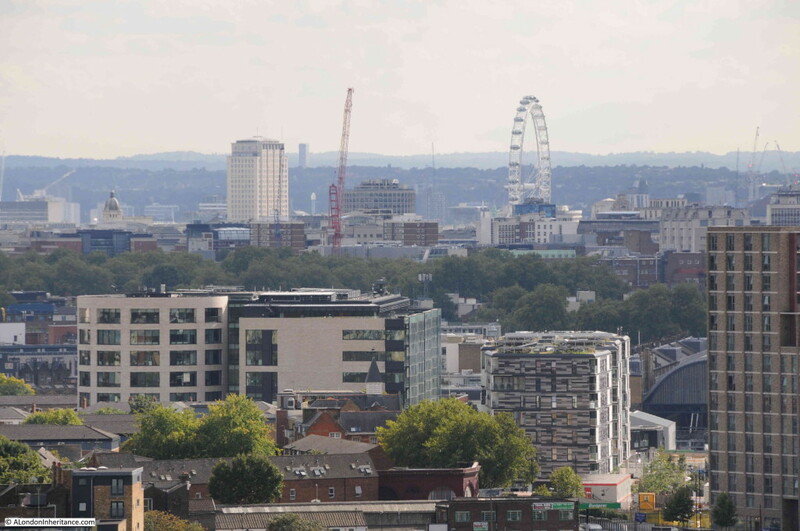 This entry was posted in London Buildings, London Vistas and tagged Caledonian Clock Tower, Caledonian Park on October 4, 2015 by admin. 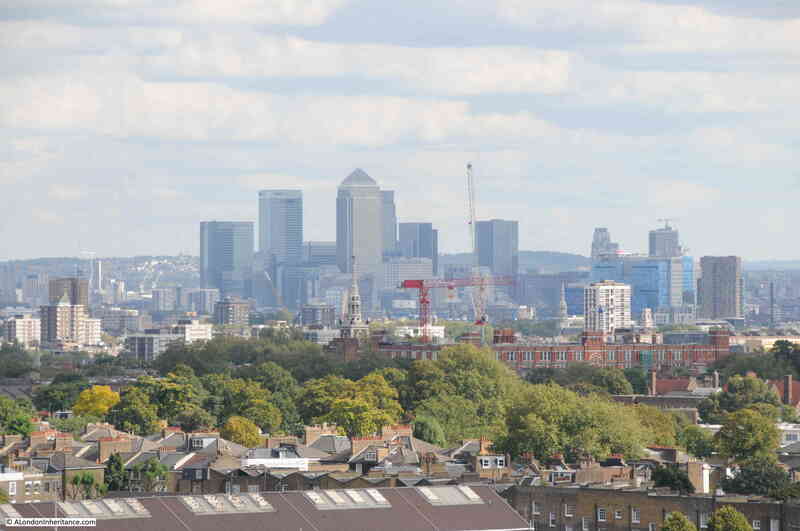 Absolutely stunning of London – it is so rare to see ‘new’ views of such a familiar city. Thanks for sharing these, and the many others in your blogs. Thanks Donna – appreciate the feedback. Imogen, thanks for the comments on the post. One of the guides on the day mentioned about the opportunity to help wind the clock and it would be wonderful to volunteer, but a full time job restricts my time at the moment (including being very slow at responding to comments !) Hopefully one day in the future. 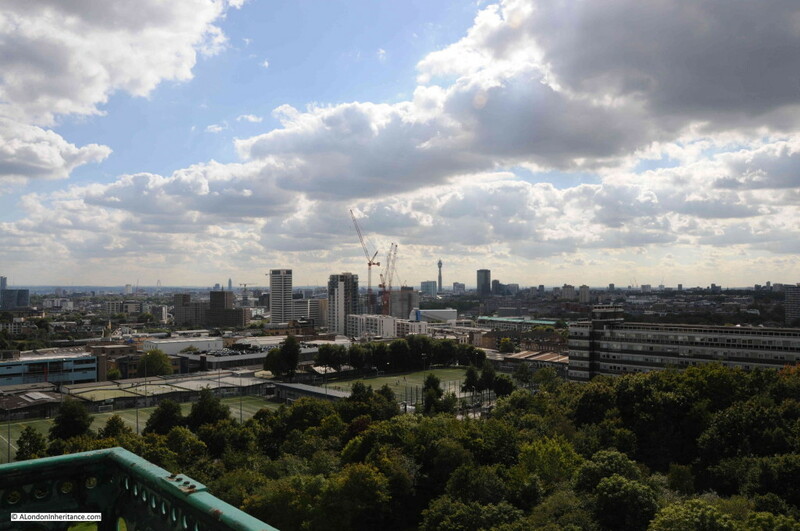 The tower is a fantastic historical reminder of the history of Cally Park, and as you must known the views from the top are some of the best in London. 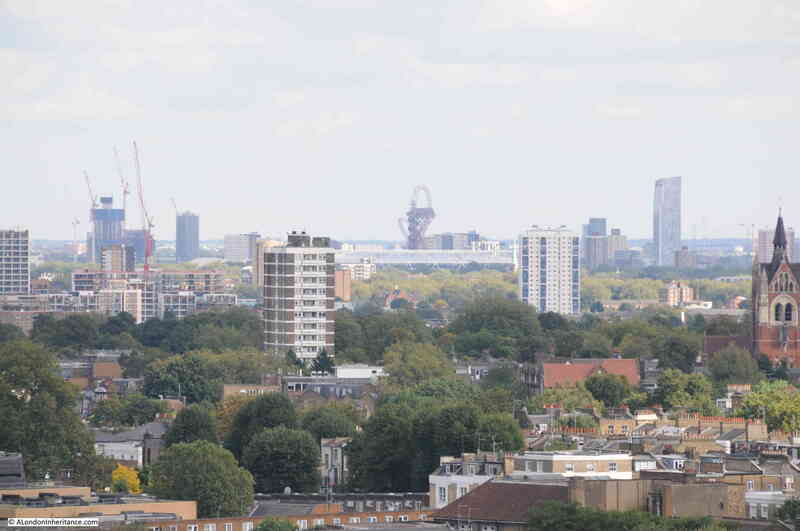 Having lived in ear shot of the Tower (can remember it’s chimes late at night while in bed) it’s something very dear to my heart and I must climb it one day and see the views of London and my house from it. It may no longer clime but long may it stand! Thank you for a comprehensive visual and written piece, much appreciated. I have been admiring the clocktower for more than a decade without knowing any of its facts. The Heritage Lottery Fund confirmed a grant award of £1,873,300 in December 2016. I have only just visited this site, really by accident! The Buildings at the bottom of the Clock tower (built in the same lime stone, and in a circle) were for the market administration. The Existing Buttresses, in fact were also Chimneys. The buildings included the wages, the Postal service, and the Metropolitan Cattle Market Police station. I know this because I was born just across the road (Corinth Road) While the Market was still a working Live Stock Market and Slaughter House. My father Mr James Burrows, who worked at the market, did the maintenance for the Clock Tower while he worked there, including Winding the Three Weights for the Chimes, on a weekly basis. Which he continued to do, even after the market closed, and for Many Years, without being paid, this didn’t matter to him, it had become part of my family’s life! Indeed, when my father couldn’t wind the clock, I did, from the age of 12 It was, to me, a matter of Family Honour. After the Market closed. 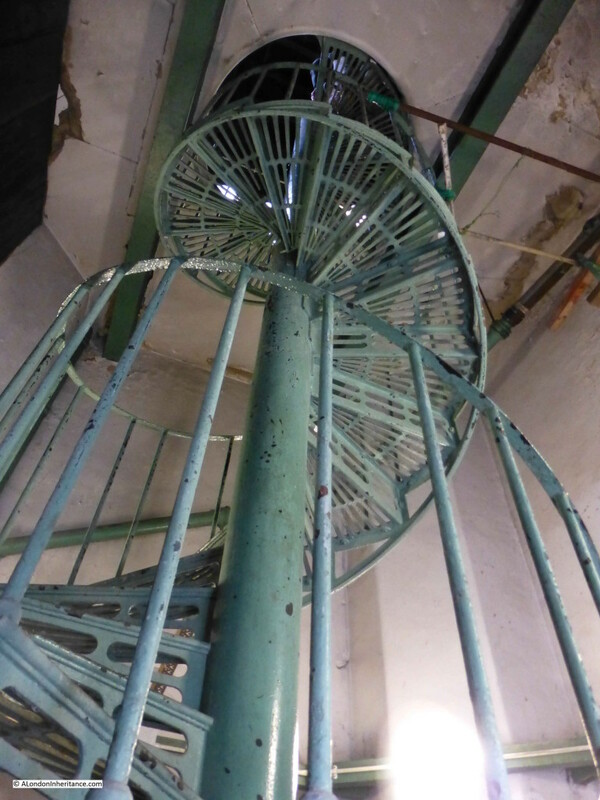 The Tower was, abandoned by everyone except my Father, it was Continually Vandalised, but my Dad spent his own money and time to keep the tower Secure. 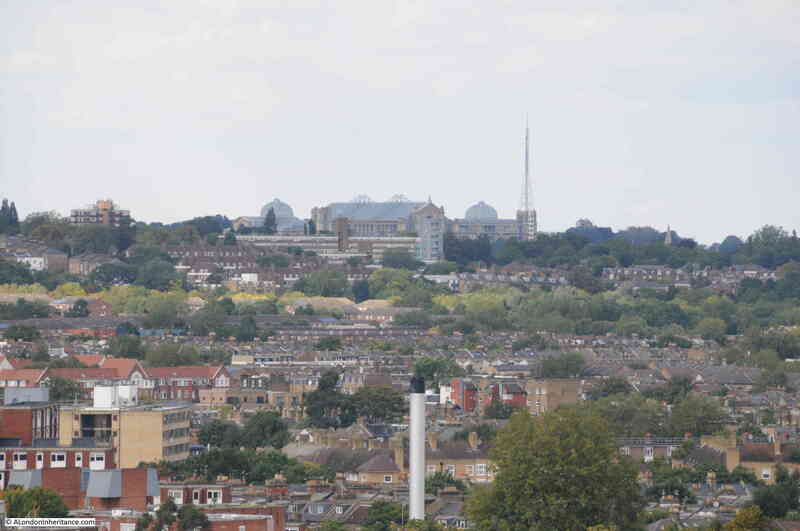 And he fought, For Years, to Stop it from being either Sold, or Knocked down, Until He managed to get the Tower recognised by English Heritage. If you would like any more information, I’m sure my father would be only to please to tell you. I realise that it is nearly a year since you posted here but I have been trying to find your Dad, Jimmy, but with no luck. Jimmy is my cousin and our family also lived in Corinth Road. For many years now we have been following his history with the Caledonian Market Clock and your post here has been the first contact we have found of the family. Would it be possible for me to speak with Jimmy or failing that yourself?